The holidays bring with them a mood of merriment and leisure, as we begin to wind down and collect ourselves from a hectic year. Loved ones rejoin their families, eggnog and other libations flow freely, airports and highways seem to bust at the seams with swells of determined travelers. However, there are at least a few unfortunate side effects that occur when we combine these factors. The uptick in parties and festivities, accompanied by the increase in air and ground traffic, mean that our roadways become considerably more dangerous this time of year. Although the hazard of drinking and driving is prevalent on many other holidays (St. Patrick’s Day, Fourth of July, Memorial Day), the relative concentration of holidays makes for a particularly dangerous stretch, beginning Thanksgiving weekend and ending New Years Day. This state of affairs often puts law enforcement on edge, with local news outlets around the country usually reporting that DUI patrols in their area are set to increase over the holiday season. The surge in alcohol consumption begins with ‘Blackout Wednesday,’ a verbal play on Black Friday that refers to the Wednesday just before Thanksgiving. Between the droves of students returning home and reuniting with friends, to those who can’t be with family for the holiday, there are a bevy of reasons why Americans flock to bars the evening before Thanksgiving. The holiday already increases traffic on roadways, but the amount of impaired drivers likewise increases – skyrocketing the odds of an alcohol-related accident. This trend of increased DUI risk persists through the end of the year, with a slight lull around Christmas day, because more families are inclined to stay in their homes and off the road. The risk spikes again on New Year’s Eve, as revelers join one another at parties to toast the ball drop. 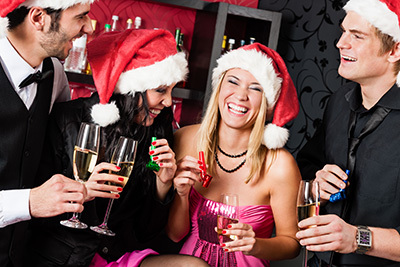 Studies indicate more than 42% of accidents on New Year’s were alcohol-related. However, statistics indicate that alcohol-related fatalities on roadways are lower when New Year’s Eve falls on a weekday. This year the holiday will fall on a Sunday, meaning law enforcement will be all the more alert. Every year, the National Highway Traffic Safety Administration runs an urgent safety campaign to spread the message Drive Sober or Get Pulled Over. Deterring drunk driving is the chief goal of this campaign, and the NHTSA fervently warns drivers of the cost of drunken driving, writing “Charges range from misdemeanors to felony offenses, and penalties for impaired driving can include driver’s license revocation, fines, and jail time…. [and] upwards of $10,000 in fines and legal fees.” This is why it is critical for motorists to engage in responsible behavior over the holiday season to eliminate their risk of drunk driving charges. Provisions of prevention include designating a sober driver, not letting friends drive impaired, ensuring all of one’s guest leave with a sober driver, always wearing a seat belt and calling a taxi or app-based rideshare if you have been drinking and cannot drive home. This holiday season, remember to drive safely. However, we understand drunken driving charges can happen to anyone. Few things can dampen the mood of the season like the misfortune of a drunk driving charge. If you find yourself ensnared in such charges in the state of New Hampshire, you will need exceptional legal counsel to protect your rights, investigate your case and help you navigate the complex legal system. Time is of the essence in these cases; do not hesitate to contact the Manchester, NH DUI legal team at Tenn And Tenn, P.A. immediately for a free consultation.